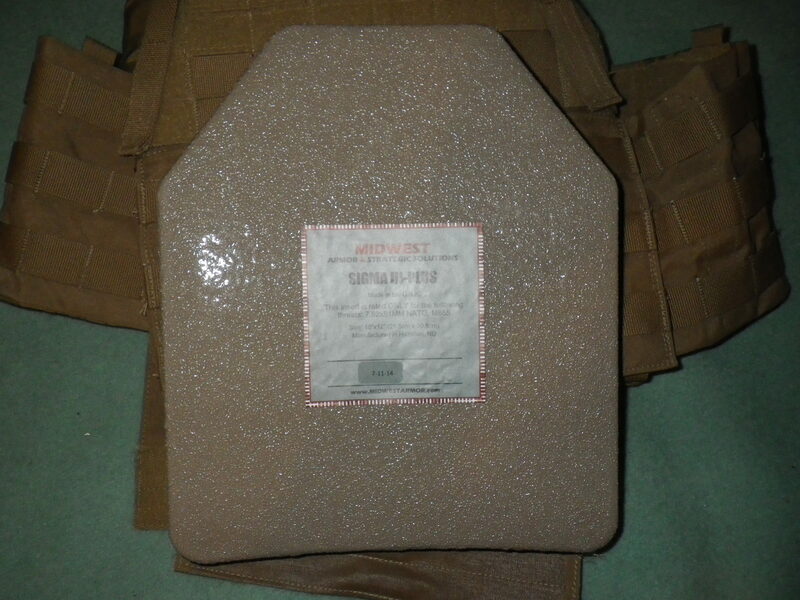 With the tremendous interest in the D-Rmor Gear Spall Guards, there have also been requests for a IIIA soft armor plate backer that exhibits similar workmanship, durability, and effectiveness. I have listened, and am in the process of reviving the classic D-Rmor Plate Backer. Some of you may have purchased earlier versions some years ago, and the latest version (this will be 6.0!) will exceed all previous examples. -Outer shell of 500D Cordura. Designed to hold up over years of hard use, it will have a *10 YEAR REPLACEMENT GUARANTEE* If for whatever reason the backer(s) experience workmanship or materials failure during the course of use during that time, I will repair or replace at my discretion. No other piece of soft armor can currently claim that sort of longevity. Furthermore, if it is used in a verified duty or self-defense event, I will replace it for FREE. No questions asked. Fully transferrable. Again, who else? They will initially be available in 10″ X 12″ format, with other sizes to come. Pricing is set at $130 individually, and $235 for a pair. Slightly more expensive than the garden variety soft armor backers, and actually less expensive than others. Worth every penny for the legion of extra benefits! Please email me to get on a notification list. Availability will be October of 2014. Because bullets and fragments are not the only threats out there, current technology has developed ways of dealing with some of the oldest weapons known: sharpy pointy things. Ballistic armor is designed to stop high velocity projectiles, while cut/stab armor is designed to stop very slow (relatively! ), sharp and pointed objects from cutting/piercing the wearer’s skin. This type of armor is a continuation of the most ancient forms of personal armor, which has seen the use of bone, fabric, leather, and finally metal. It is interesting that the current state of technology has returned to the use of fabric as the primary defense against thrusting and cutting implements. As it has been for millenia, there are always trade-offs in terms of protection vs. weight/concealability. The most protective suits, while they can be made with extremely good ergonomics, will tend tno be hotter, heavier, and far from low-profile. Semi-rigid and rigid armors, which include forms of metal mesh (traditional “maille”), interlocking articulated plates (metal or metal/composite), lamellar, or solid plates are very efficient at stopping cuts and thrusts. Their weight and heat burden tend to be fairly high. Materials range from stainless steel, titanium, to rigid para-aramid (Kevlar/Twaron). Level I armor is generally the best choice if wearing for long periods and/or concealed. Level II is a good compromise between concealability and protection. Level III is for short periods of time, and is not generally concealable. 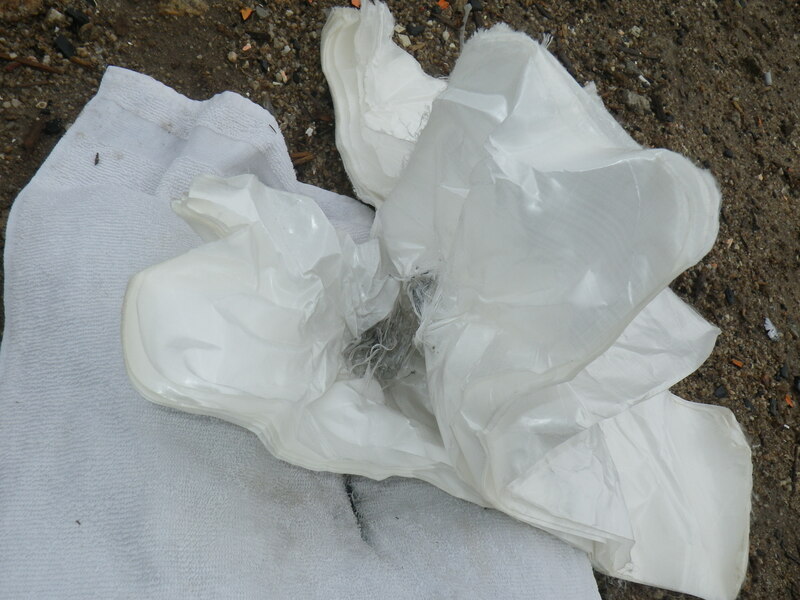 The test protocol involves dropping a weighted sabot (weighing about four and a half pounds) from different heights with the test blade or spike onto the armor sample. Up to 7mm of penetration is allowed at the minimum force, and up to 20mm at the maximum force. Any greater penetration at either energy will fail the armor. There is *no* penetration permitted for the spike test at any energy level. 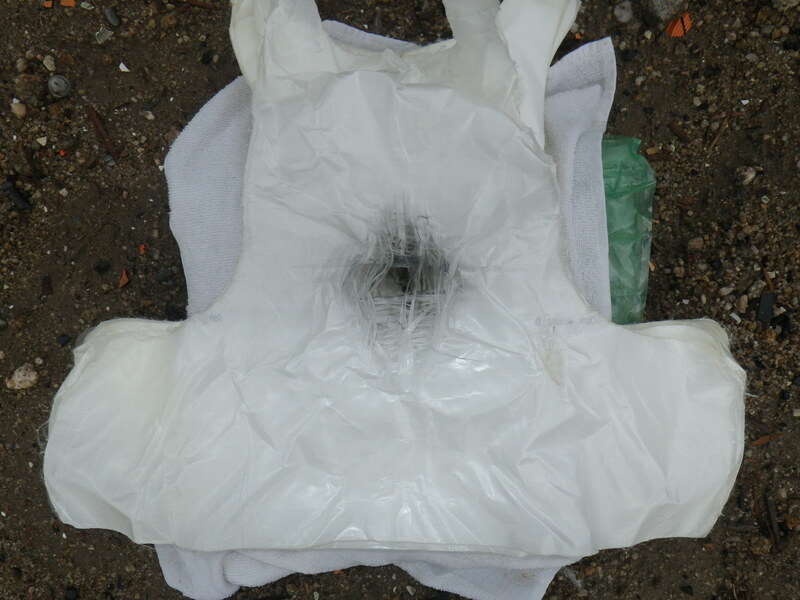 A single sample armor may be subjected to over 30 drops, with no overpenetration permitted. I am sure a lot of folks are wondering about how well knife/stab armor performs against bullets. The answer is “not as well as a dedicated ballistic vest.” K/S armor is engineered towards a very different threat compared to handgun rounds. Knives, spikes, and syringes have a very small frontal area compared with handgun bullets, and as such, require different materials and construction methods to be used. There are dual and triple rated vests (ballistic + knife and ballistic + knife + spike), but they are generally VERY expensive, and heavier/thicker than dedicated armors. If you absolutely have to protect against multiple threat types, try to wear before purchasing to ensure it is comfortable. So to summarize: while there is some overlap in the capabilities of bullet resistant vests to stop blades, and knife/stab armor to stop bullets, unless they are specifically engineered to do so, don’t rely on them to protect you from all threats. 1. Must be high-volume shooters, with >500 rounds per month. 2. Must put the majority of rounds downrange at rapid fire pace (fast semi or auto). 2. Must have a suppressor with nominal OD of between 1.25″ and 2″. 3. Must not have a suppressor with more than one major OD dimension. 4. Must be willing to document the use of the suppressor shroud in words and pictures over the 3 month testing period. 5. Must be willing to share the documentation with D-Rmor Gear, to include posting on the blog. 6. 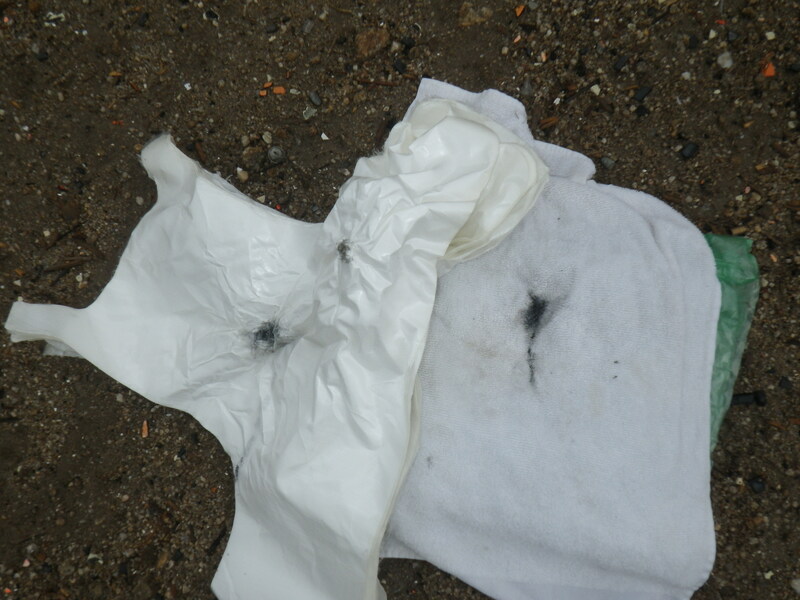 Must return the shroud to D-Rmor Gear at the end of the evaluation period, or sooner in the event of failure. As compensation, testers will get the option to purchase a CanGuard(TM) at 70% discount upon completion of the final version. Plus the accolades and gratitude of the internets for helping advance the science of Suppressor Shrouds. If this sounds like you, please send an email today. This testing and evaluation is slated to begin the second week in October. I will be building the evaluation shrouds to your specific cans, so please provide exact dimensions (break out those micrometers if possible). 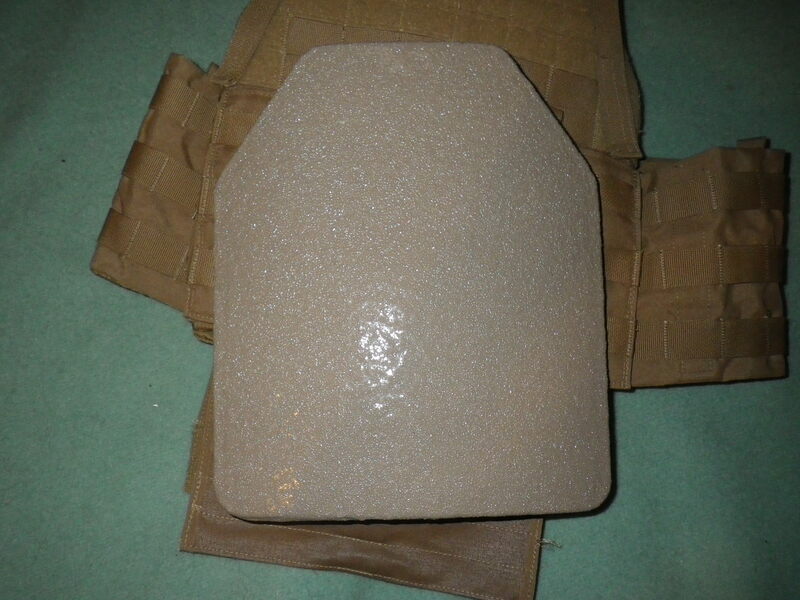 Over the past half century, the primary fiber for use in soft body armor applications has been Aramid fiber (known commercially as Kevlar or Twaron). And though continued innovations and improvements have kept this fiber at the top of the heap in overall effectiveness, it is nearing its plateau. There is only so much that can be done with the (admittedly excellent) fiber, and a worthy successor has been chosen. Some time ago, it turns out. Originally developed in 1998 by Azko Nobel, M5 was first produced by Magellan, and subsequently by Dupont, which purchased the rights from Magellan in 2005. With a modulus of around 310 GPa and tenacity of around 5.8 GPa, it exceeds every current high-strength fiber (with the exception of carbon nanotube fibers) by a large margin. It derives its great strength, in part, from its ability to form hydrogen bonds in 4 axes (by comparison, Aramid only forms biaxial hydrogen bonds). In addition, it is more flame resistant than Nomex, and exhibits almost no degradation when exposed to UV light. It also tolerates humidity well. Essentially, it shows none of the weaknesses inherent in current ballistic fibers, while being far stronger and tougher. So why are we not seeing this fiber in commercial armor yet? Well, it is in part due to the exceptional characteristics. M5 requires “tempering,” which is a combination of heat treating and tensioning of the fibers as they come off the spinnerets. Unfortunately, equipment designed for Kevlar would be destroyed if it was used for processing M5, simply due to the incredible strength of the fiber. It is thought that much of the delay in bringing this fiber to market is due to the massive retrofitting required to process it into fabric. One thing is for certain- the translucent blue M5 fiber will eventually replace the iconic golden yellow Aramid fiber as top dog in ballistic armor. Keep your eyes on M5, it will make quite a splash when it goes live. The legendary Tactical Armor Products GAMMA III+ series of plates was one of the most highly regarded rifle plates of its time. With decent weight, good quality build materials, and excellent stopping power, the now extinct TAP’s plates command a premium on the secondary market. To fill the vacuum left by the discontinuation of the GAMMA, Midwest Armor stepped up to the plate. Like pretty much everything else in their linup, their continuation of the lineage, the SIGMA, was a grand slam. I ordered my sample of this plate from Appalachian Training. Though they did not even have it officially in stock at the time, Mike was more than happy to get the ball rolling. The plate was a little over $449 shipped, thanks to Appalachian’s enviable flat rate shipping rate. Due to an unfortunate (albiet very minor) issue with the plate’s PU finish, I got to experience the superhuman customer service that both Appalachian, and Midwest, strive for. I alerted Mike to the issue, and from that moment, it was as if a small army of extremely efficient Armor Ninjas were set in motion. I had an RMA number and label in my hands within mere hours, and the plate was back to Midwest, but NOT BEFORE they had already initiated shipping on a replacement. The box showed up two days later, full of extra goodies (some edible, some not). Now that, folks, is how CS is done. The replacement plate arrived in good order, and the unboxing commenced. Even though this is armor, and is rugged as heck, the packing job done by Midwest would have kept a dozen eggs from getting so much as a single crack. The extra little details really matter. Midwest Sigma 3+ front strike face. The first impression of the plate was “tough.” The tan PU coating is really grippy and resilient. 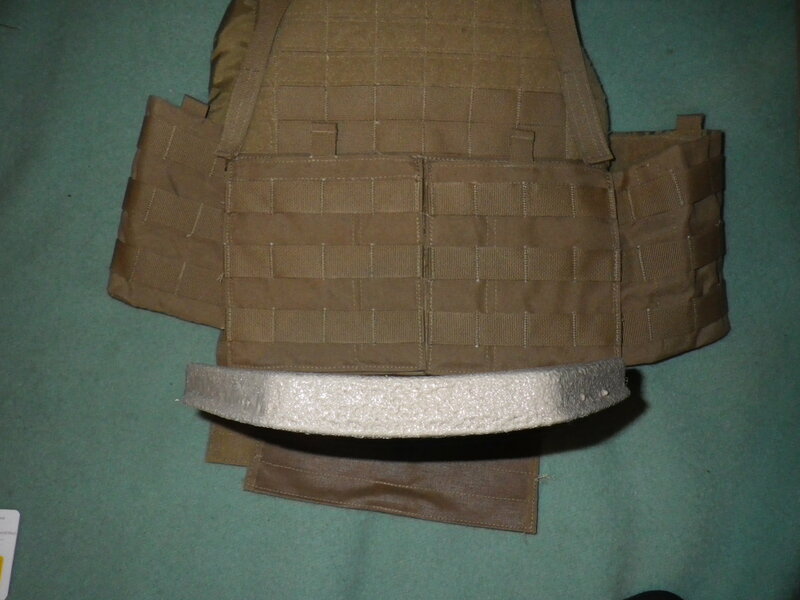 Curvature is not too extreme, and fit my plate carrier very nicely (SKD PIG). Weight is right at 5.45 lb. and thickness is 1.27″. The weight puts this into the “just under medium” category. Much lighter than steel, it is still heavier than the pure UHMWPE plates. However, this is due to the welcome addition of a thin ceramic strike face (in keeping with the GAMMA theme), which allows it to defeat the Green Tip M855, the bane of all UHMWPE plates. Overall, I give this plate 4.5 out of 5 stars. The only reason it was not 5 stars is that I generally don’t give 5 star ratings to anything. This plate is rugged, relatively affordable, and comes with a 5 year warranty (and take it from me, if you need the warranty, you will be well taken care of). Kudos to Midwest Armor and Appalachian Training. They make and sell excellent products. The D-Rmor Gear Armometer(TM) is now available again. I underestimated the demand, and have remedied that. Get yours today! 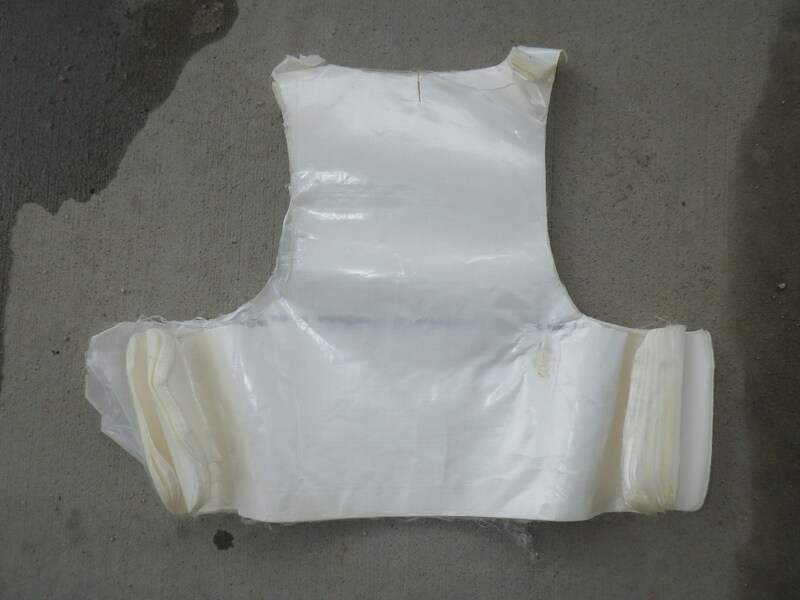 In several of my posts, I mention that while UHMWPE UD armor is an excellent choice for certain applications, and has material advantages over woven or laminate Aramid ballistic fabrics (higher potential V50, positive buoyancy, UV resistant, waterproof), it suffers from several glaring weaknesses (degrades to complete ineffectiveness above 170F, no breathability, delaminates/curls, and is WEAK AGAINST CONTACT SHOTS). It is important to reiterate that last weakness: a large number (if not the majority) of self-defense and duty scenarios take place at 0-5 feet, where contact shots are a high likelihood. 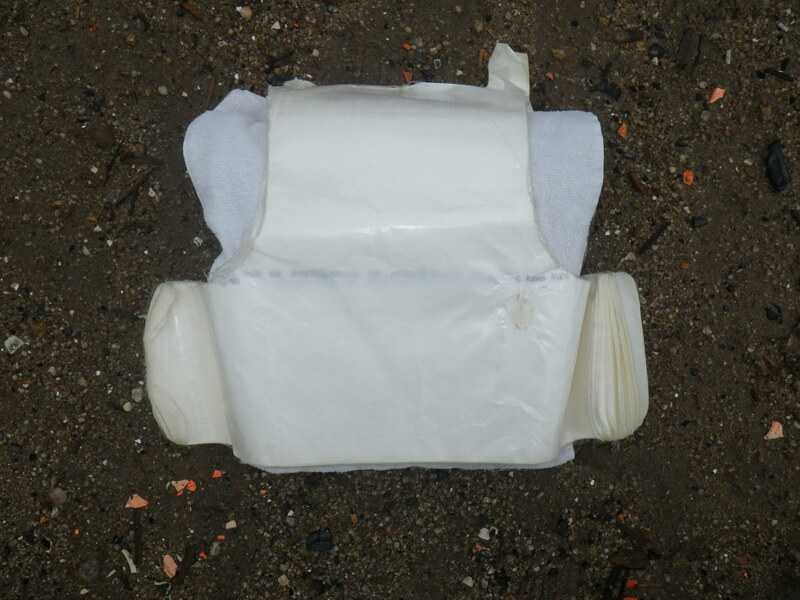 Woven Kevlar soft armor has shown to provide EXTREMELY good protection against contact shots (defined as the muzzle of the weapon being in physical contact with the vest or armor panel). 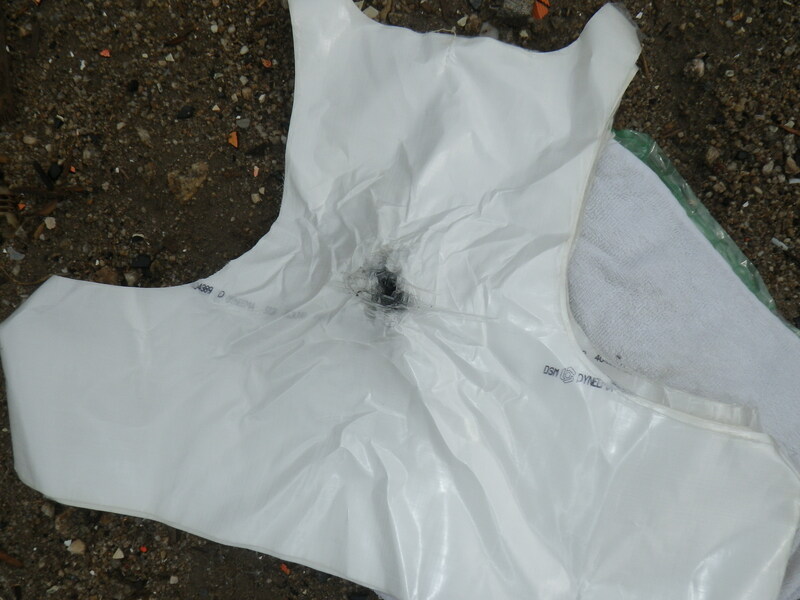 The point at which Kevlar chars is around 500F, and it will retain its strength below this temperature. The failure mechanism for UHMWPE in contact shots is the high temperature propellant gases that exit the muzzle microseconds after the bullet. 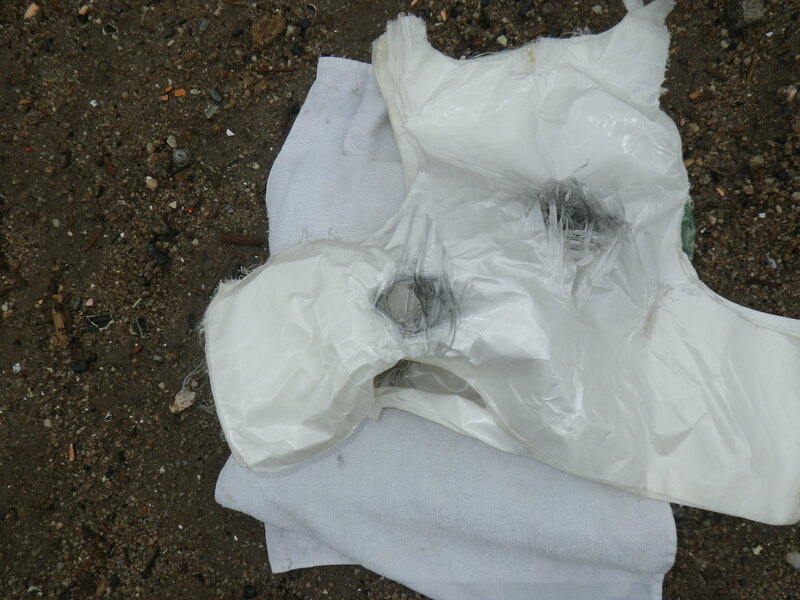 These gases heat the area surrounding the muzzle and bullet path, and cause the laminate to melt/denature. This allows the bullet to penetrate much further than would normally be possible. In the case of large caliber revolvers (with a large muzzle blast footprint), this can allow the round to completely defeat the vest. For the sake of the test, the round chosen was the .357 Magnum, rather than a .44 Magnum, as I wanted to see if the (relatively!) more modest caliber would still defeat the level II ballistic panel. The panel consisted of 15 layers of Dyneema SB-38. 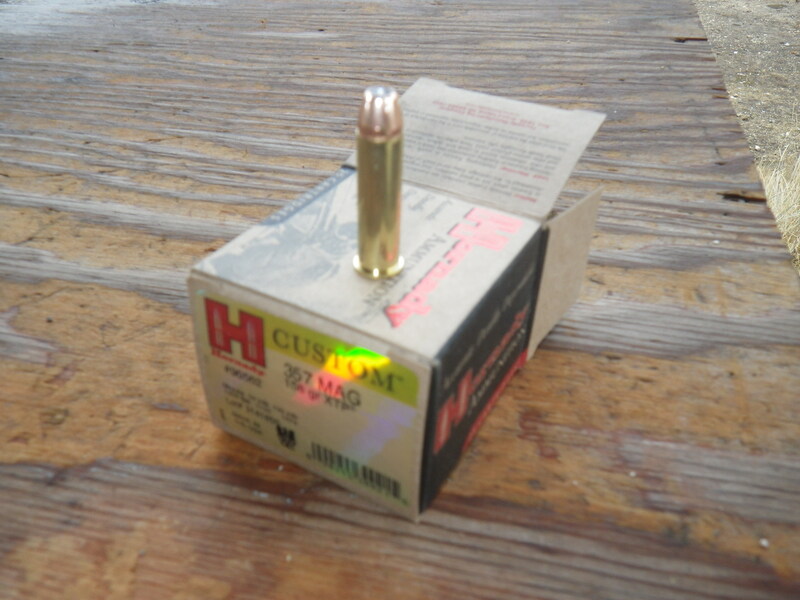 Round chosen was Hornady Custom 158 gr. XTP @ 1250 fps muzzle velocity, from 6″ barrel. The level II panel is specced to stop an equivalent round. 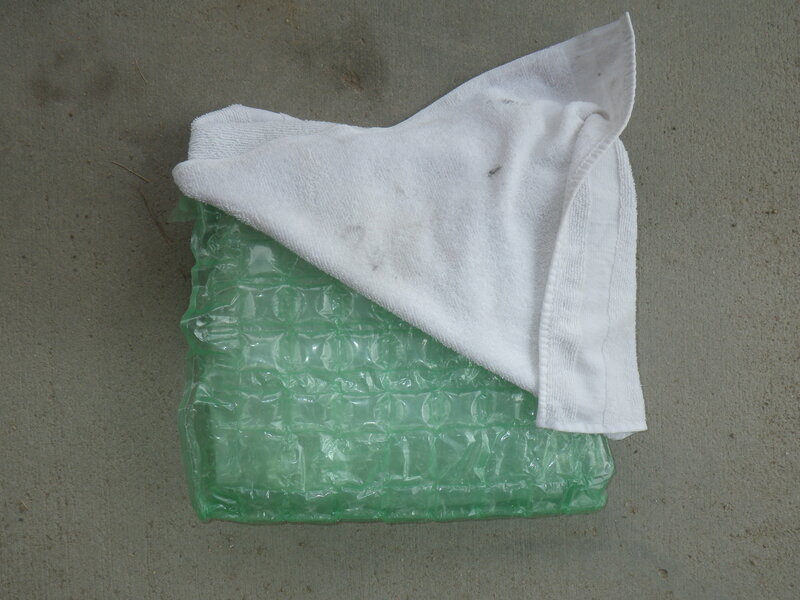 The panel was placed against a backing material consisting of 8 layers of bubble wrap, covered in a dish towel. In retrospect, this was probably a bit too “springy,” giving the panel an advantage by permitting it to move away from the hot muzzle blast faster than if the armor was being worn. The test panel and backing were placed upon the ground, and the muzzle pressed firmly (but not forcefully) against the surface. The round was discharged into the center of the panel. 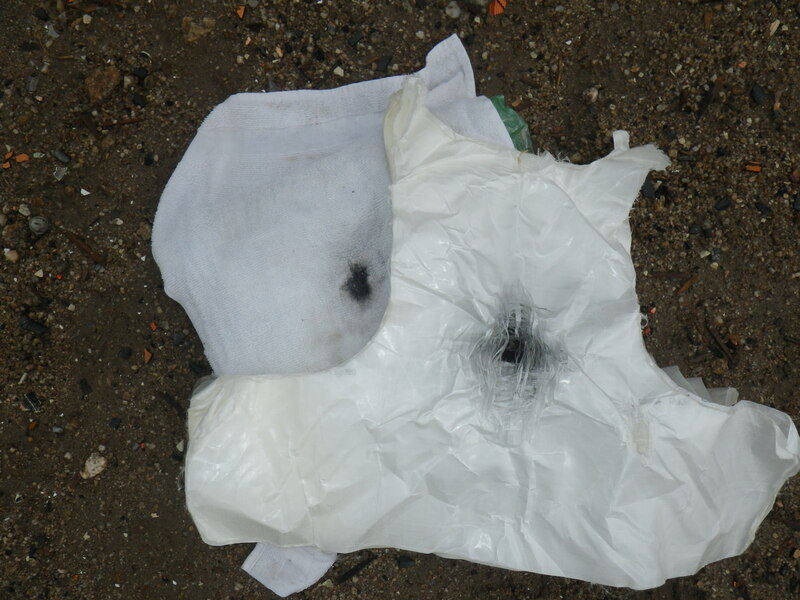 The panel was defeated, showing that the muzzle blast had melted a moderately large area around the point of contact. 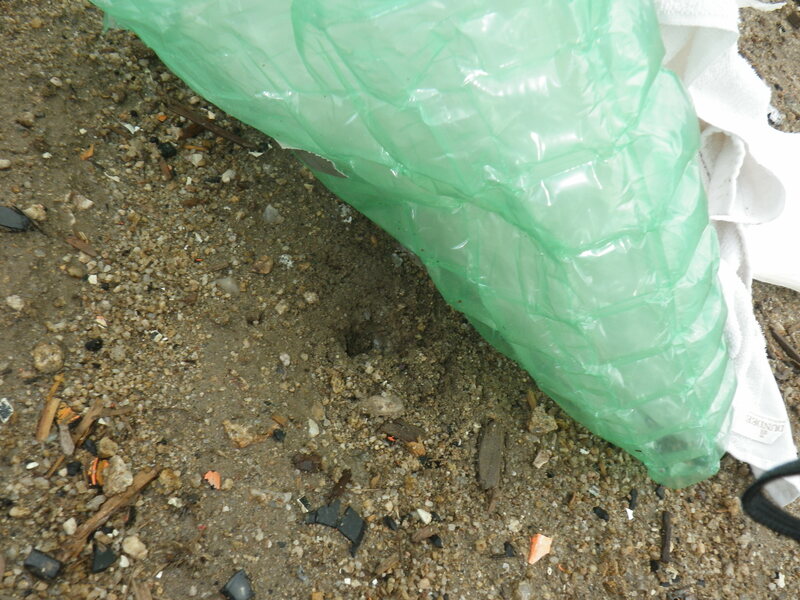 The round penetrated the backing and buried itself into the dirt (as shown). To verify, a second round was fired into the lower left area of the panel (away from the heat affected zone of the first round). 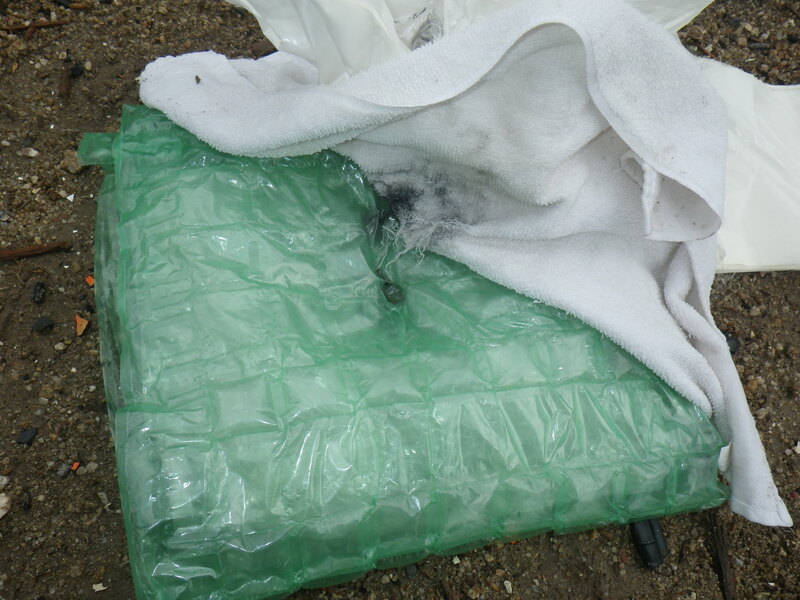 The second round performed identically, burying itself into the dirt beneath the panel. The results of the test shows that UD UHMWPE laminates are at risk vs. contact shots. Heat from the muzzle gases (especially medium to large caliber revolvers) “blazes a trail” so to speak, for the round to penetrate further than it normally would. What this outlandish legislation would do is instantly make felons out of millions of honest Americans. Banning an inanimate object because of what a vanishingly few *MAY* do with it is not only illogical and irresponsible, but unlawful under the public law. It is the equivalent of banning the wearing of seat belts in cars. Please get out your quill and parchment, and WRITE to the Senators to voice your disapproval of this preposterous affront to health and safety. Armor is part and parcel of ARMS. We the Public need to be heard.